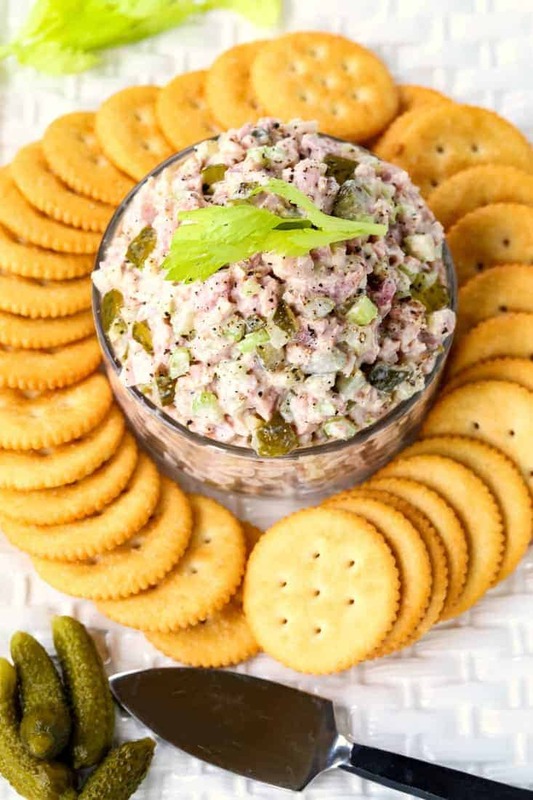 Dill Pickle Ham Salad is an amazing leftover ham recipe! 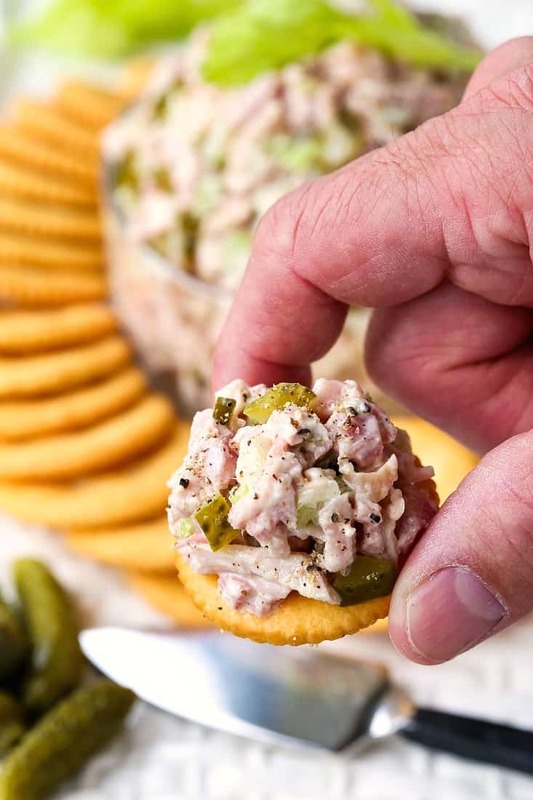 This creamy ham salad with dill pickles works as a cracker spread or a sandwich filling! We’re usually serving up our famous SPIRAL SLICED HAM for the holidays! So we have tons of leftover ham…or another great leftover ham recipe is this comforting SLOW COOKER HAM AND NOODLE soup! 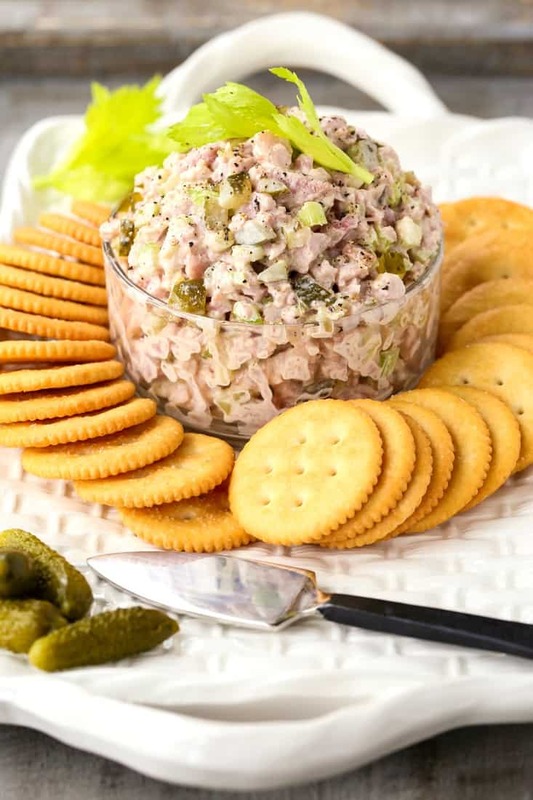 Ham salad is a great way to use leftover ham after a holiday or party, but we love ham salad so much we buy ham just to make this recipe! 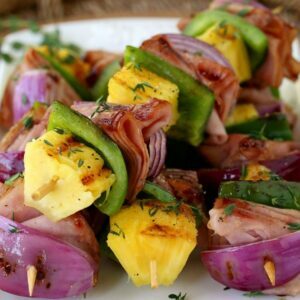 You can eat it as a low carb snack or lunch with celery sticks or in lettuce wraps, or as a spread for crackers on a cheese board or filled into fluffy white slices of bread. All of the above work for me. What you need to decide about ham salad is how fine you like the texture to be. We like our to have a little chunk to it like you see here, but you can process your ham in a food processor until it’s the texture of spreadable tuna salad if you like. 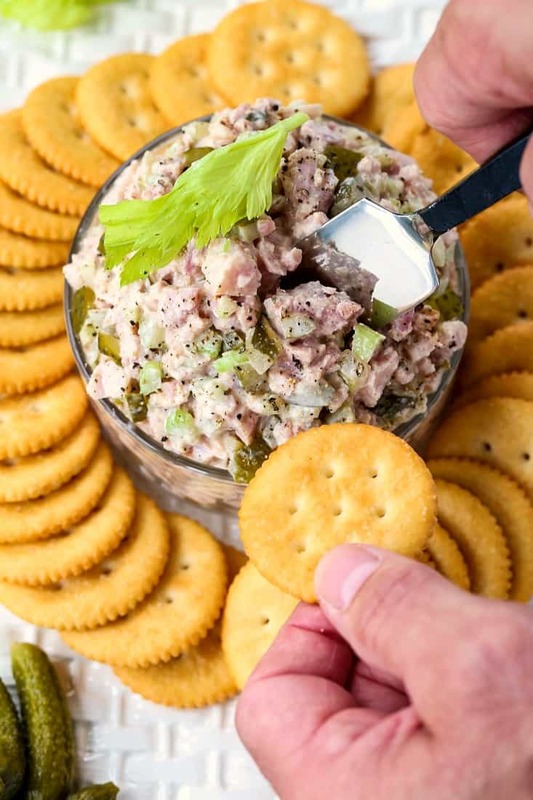 Adding dill pickles to our ham salad recipe wasn’t a big stretch, usually we use pickle relish or some chopped up pickles in our tuna salad too. The tangy pickles go so perfectly with the creaminess of this ham salad…you’re going to love it. 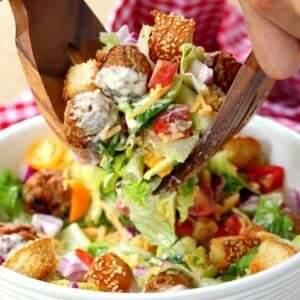 What To Serve With Ham Salad? Like I said before, you can serve your ham salad on a cheese board for appetizers, or all on it’s own. Scoop it up with crackers, pita chips or even pretzel chips! Keeping it low carb? Try stuffing this ham salad into celery sticks or piled on top of cucumber slices. 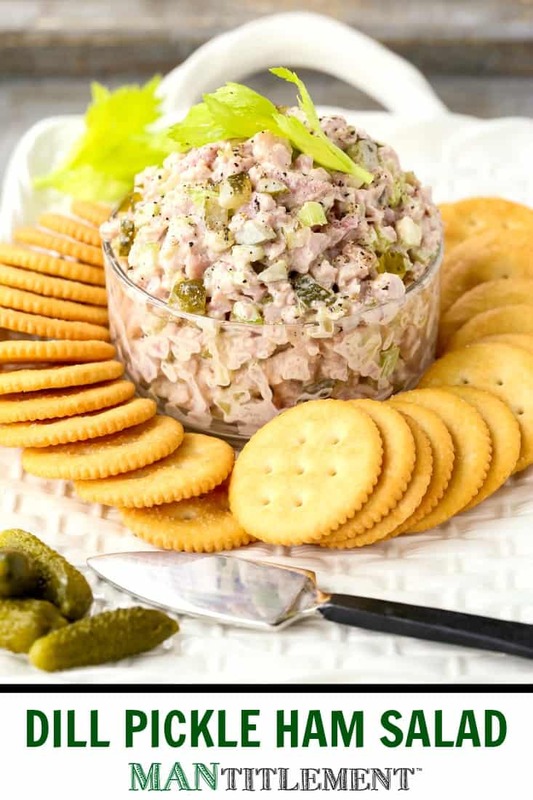 Don’t forget to take this ham salad spread and make a sandwich too. That’s how our kids like to eat it, on white bread with cheese. Sometimes even grilled. That’s where you can decide on the texture, if you’re using it in a sandwich you might want your ham salad finer more like a spread but it’s totally up to you. So what makes this the best ham salad recipe? Well it’s going to start with your ham. Taste your ham to see how salty it is before you start adding any seasonings here. Actually, I didn’t include any salt in this recipe because all ham is going to be salty, but how salty you like it is up to you. So, this one I’m going to say is a matter of preference. Looking up a few different recipes, I did see some that said you can freeze ham salad…but I’m going to go with no. Typically I don’t really like freezing anything with mayonnaise in it. The texture isn’t ever right after thawing out again, but like I said, it seems to be a matter of opinion. What I’d recommend is just freezing the ham itself. You can even process your ham to get it chopped up and freeze it into a 1 pound package, or a few packages. That way when you want to make some ham salad you can grab a package of ham from your freezer and make it fresh. Also, you can definitely make this recipe without the pickles if you aren’t a pickle fan. 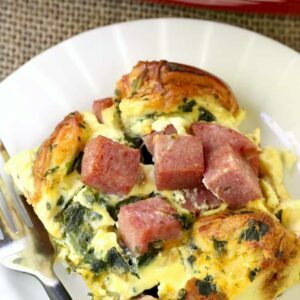 It’s an easy ingredient to leave out and still be a delicious recipe! This delicious ham salad is the perfect way to use up leftover ham after a holiday! Even if you don't have leftover ham, grab some from the deli or even use a ham steak! Chop the ham into a small dice using a knife or food processor, then add to a medium bowl. Add the remaining ingredients to the bowl with the ham and stir to combine. Taste for seasonings and adjust if needed. Wrap with plastic wrap and refrigerate for 1 hour, then stir again before serving. Serve with crackers, pita chips, celery sticks or use in a sandwich. There is no salt in this ham salad because I felt the ham was salty enough, but you can add a pinch of kosher salt to your taste.